Direct flights to and from Athens. Business class prices available upon request. Escorted transfers between Athens airport and the port. First Class ship transfers to and from Amorgos. 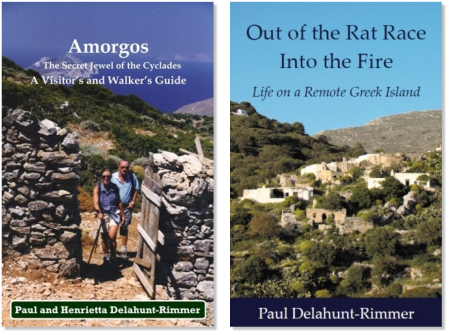 Complimentary copy of our book: Amorgos - A Visitor's and Walker's Guide. Transfer to the hotel on the island. 8 or 15 nights Bed & Breakfast. An arrival briefing about Amorgos. 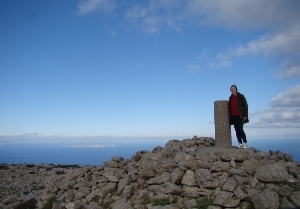 A retired British registered nurse (RGN) accompanying most guided walks. Land Rover and donkey backup on most guided walks. 24 hour support on the island for any troubleshooting or advise. Transfer from the hotel to the ship on departure. Transfer from the ship in Athens to the airport. 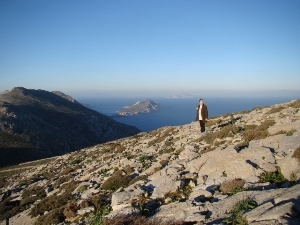 Amorgos is a unique unspoilt walker’s destination in Greece. There are hundreds of kilometres of paths. Many are maintained by the island authorities and volunteers. With guidance from the book ‘Amorgos a Visitor’s and Walker’s Guide’ or the assistance of Special Interest Holidays guides (cost pro rata) you will find places most visitors never get to see. 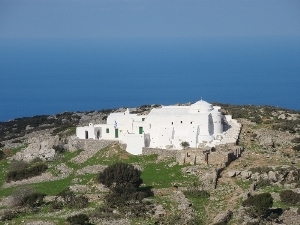 The great beauty of walking on Amorgos is that the island is incredibly diverse and rich in antiquities and sights. Walking in the north and then in the south you would think that you were on a different island. The cliffs and peaks above Langada towards Stavros have been described as ‘Alpinistic’ whilst the landscape of the south is far less rugged. Before the road was finished these were two very different communities in their way of life and culture. Even today you can detect a difference. 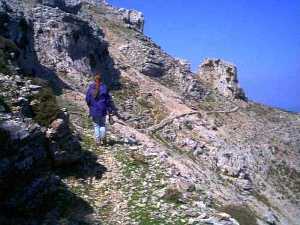 Walking on Amorgos is always exciting as there is something different to see and varying experiences every day. The other attraction is that in a two week stay and by following the guide book you can see most of the island and truly say, ‘we have done Amorgos’. Following the walks described can be as challenging or as easy as you wish, the aim is flexibility. You are even offered the occasional optional challenge to explore on your own. Whether you just enjoy walking for the exercise and the spectacular scenery or you are an ornithologist, botanist or historian you cannot find a better destination in Greece to pursue these interests. Take to the mountains, discover remote coves and caves, see rare flowers and birds, explore remote archaeological sites. Amorgos, ‘The Secret Jewel of the Cyclades’ is a walker’s paradise just waiting for you to arrive with your boots and walking sticks.